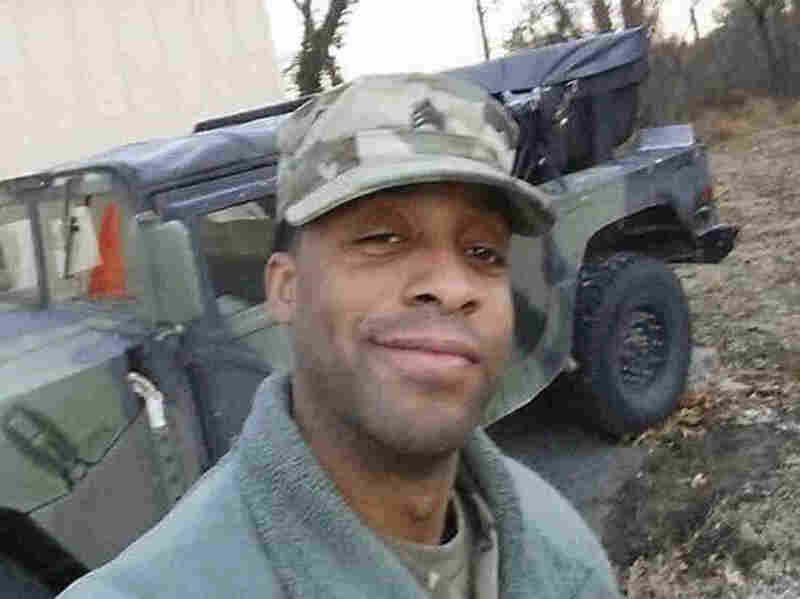 Body Of Missing Man Found After Ellicott City, Md., Flood : The Two-Way Army National Guardsman Sgt. Eddison Hermond vanished trying to rescue a woman on Sunday. Rescuers pulled his body from the Patapsco River Tuesday. Howard County Police officials said rescuers pulled the body of Army National Guardsman, Sgt. Eddison Hermond, from the Patapsco River Tuesday. The search for the body of Maryland Army National Guardsman, Sgt. Eddison Hermond, who was swept away in the rush of the flood that tore through Ellicott City Sunday, is over. Hermond's body was found in the Patapsco River by rescuers Tuesday, according to Howard County Police. Police officials said Hermond, 39, was last seen at a Mexican restaurant called La Palapa Grill & Cantina on Main Street on Sunday at about 5:20 p.m. and was reported missing at around midnight. Police Chief Gary Gardner told CBS Baltimore that Hermond left the safety of the restaurant to help rescue local shop owner Kate Bowman. "He, along with some other folks, went back to assist her and unfortunately during that effort they saw him go [under the water] and not surface," Gardner told reporters. He said others made it out of the area safely. "He just stepped over the ledge and he was immediately washed away," Bowman told The Washington Post on Monday. "It was so fast. He just got washed away real quick." Moments before she was spotted by Hermond, Bowman had climbed out of the shop window with her cat. Since then, police and news outlets including NPR have reported Hermond risked his life trying to save her and the cat. It is a misunderstanding that Bowman wants to set straight. "If he passed, I want people to know he passed trying to save a person, not a cat. He was trying to save me. I want his family to know that." Randy Marriner, a friend and former boss of Hermond was devastated to learn of his death. "It's just really, really sad and unnecesary," Marriner told the Baltimore Sun. "In the midst of panic and we make split-second decision that sometimes may not — while well-intended — may not have been the best decisions." Hermond was swept away in the second torrent to devastate Ellicott City in less than two years. The previous massive flood left two people dead in July 2016. County officials said this year's storm caused unprecedented levels of damage. Flood waters from the Tiber Creek washed away nearly 25 feet of roadway on Sunday, according to WTOP News. It also swept away dozens of cars. After much of the water had receded Monday, Howard County Executive Allan H. Kittleman gave a bleak overview of the damage: "If you look at the devastation and the damage, I would certainly say it's worse than 2016," Kittleman said. "We've had areas that were not even damaged at all two years ago terribly damaged this time." Ellicott City, a former mill town, sits in ravine surrounded by two streams of the Patapsco River, about 13 miles west of Baltimore. The banks of the river gave way and the muddy water rushed into the city's narrow streets, wiping out whatever stood in its way. Maryland Gov. Larry Hogan declared a state of emergency for the area, which he visited and to which he promised "every bit of assistance we possibly can." And more difficult days may lie ahead. The forecast from Thursday through Saturday indicates a high likelihood of more heavy rain.